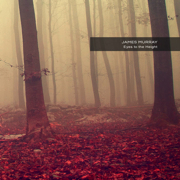 It may be that James Murray is very nearly alone in the nation of techno. A genius of nuance, Eyes to the Height (57'38") is an album rendered in surprisingly quiet tones - which build gradually in richness and depth. Whatever he has taken from EDM, he has used it to create his own personal sonic expressions - which take us anywhere and everywhere. Murray's ten beautiful electronic lullabies range from beautiful, thought-provoking, cosmic instrumental ballads, to the resonant stillness of sound masses in the fourth dimension. Eyes to the Height will fall on eager ears, as we share Murray's delight for sound. A slow rush of feelings, shades of regret, quietly joining together - for those poised to receive thought. A soft bass drum slowly bores its way beneath crystalline digital tones, to align with measured percussive snapping. Electrical notes sound in gritty space, and support keening frequencies in a glittering upper register. A few tracks have no beats at all, exhibiting just the ebb and flow of contrasting synthetic textures. Others seem to quietly surround a negative space, their design informing on the impenetrable zone beneath. Further in, crunching taps mark the slow movement of musical particles, with blessed chords ascending ever upward. After visiting a pleasant range of moods, Eyes to the Height concludes with the steady, stable resolve of surety. This journey forward, from spirited and stately to respectful and grave, has technology providing the backdrop for the most human of stories - the reach of our aspirations. An absorbing contemplation of what it means to survive the wilderness, Murray's whisper of hope seems increasingly lonely. Yet, however subtle, his works will still spend time with the world.